My child loves dogs, and this comforter set is so cute and colorful. The comforter is lightweight, but stands up to being washed and dried when it gets dirty. No bones about it, the Mi Zone Kids Wriggle Comforter Set will add cuteness to your bedroom. This comforter is printed with lovable dogs that have playful, geometric designs on their bodies. Triangle patterns are showcased against a yellow and pink ground on the ends of the comforter, while an alternating teal and white stripe pattern sits in the center. The solid teal reverse provides a playful pop of color and adds extra charm and vibrancy to your bedroom. Sham(s) accented with a plush dog face and plush paw print pillow completes this comforter set. Cute, was dissapointed as it was just one piece of material with the different colors and patterns stamped, printed on it. Very nice...quality seems good. 6 year old daughter loves it! Loves softness of dog on pillow shams &amp; dog paw print pillow. Delivery was quick. Would recommend tho product. My daughter loves this bedding set. The paw pillow is her favorite. The bedding set is good quality. I have washed the pillow shams and comforter twice already and it is just like new. This is sooo adorable!! 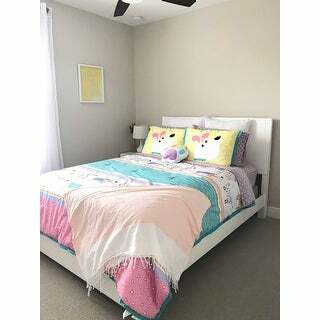 I am redoing my Granddaughters' bedroom and have purchased this for this bed. The girls don't know it yet, because I want everything in before setting it all up. But the comforter and shams are just adorable. Colors are bright and clear. I could not be more pleased! So pretty, looks exactly as pictured. The paw pillow is very soft as is the pillow cover (think almost a microfleece soft). The comforter is also soft, but a bit thin. No problem as we have a winter fur blanket added on. My step-daughter LOVED this set! Very happy we returned the prior set I hated and ordered this one. This is exactly as pictured. The colors are bright and the comforter is plush. My little girl loved it, and we enjoyed designing her whole room around the comforter. I love this comforter set, so so cute. Just to make you aware, the blue stripes have what looks like water marks on them. At first I thought it was a defect in the print, but its supposed to be there. I noticed that the stitching was different on one of the sides. However, the pattern was nice. If I didn't notice the stitching, I would have kept it. This bedding set is perfect for our toddler’s room. Beautiful colors and fits well on her queen size mattress. It arrived quickly, well-packaged, and complete. No issues! I bought this comforter for my almost 3 year old granddaughter who is obsessed with puppies. The design and colors are true to the picture. But, to say it is lightweight is an understatement. I decided to keep it because it was the look of it I was after. If it is warmth you are looking for, look elsewhere. Washed up nicely keeps my girls very warm during the winter months. Also light enough during the summer months. The colors are very vibrant and pretty! Love it! Nicely made comforter, would recommend. I bought 2 different comforters but my g-daughter picked the other. For my Grand daughter, they are perfect!